24 Day 8: 12 a.m.-1 a.m.
Now that Jenny’s trashy ex has been perforated by his partner-in-crime, Nick (who was in turn aerated by Cole), can 24 please get back to the matter at hand – those missing uranium fuel rods? Dana’s out-of-office domestic intrigue detour has been a terrible drag on the excitement of Day 8. 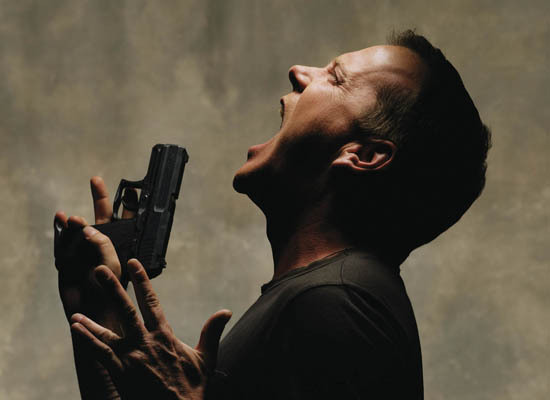 In a lot of ways this season has been a return to form for Jack Bauer (Kiefer Sutherland) as well as 24 itself. Unfortunately the back-to-basics approach seems have been a warts-and-all transformation, meaning the dull, credibility-stretching subplots are back (Remember Chloe and the baby? 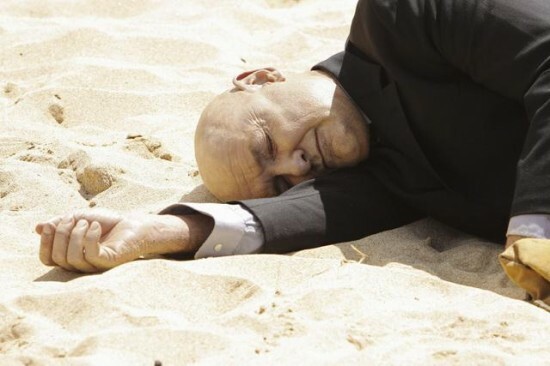 Zzzzz…). Has anyone ever labored in an office where the co-workers so worried about one another’s business? Whenever Arlo (John Boyd) wasn’t sexually harassing Dana, he was demanding to know who was talking to on the phone. I know these people are engaged in counterintelligence, but that kind of snooping beggars the imagination. And viewers have already been asked to suspend their disbelief to accept one of the central premises of the refurbished CTU: Freddie Prinze Jr. as the lead field agent for an anti-terror organization. Now, Prinze may be a pleasant-enough comic actor, but he looks 14 years old. No way is this kid the go-to guy with Jack out of the picture. Cole Ortiz isn’t even Curtis. Understand, I am a huge fan of Katee Sackhoff (Jenny/Dana), but this storyline has been a giant disappointment for her. She has had absolutely no opportunity to show viewers the charismatic brilliance she displayed as Battlestar Galactica’s Kara “Starbuck” Thrace. Heck, even her gig on the Bionic Woman reboot gave her more chances to shine. 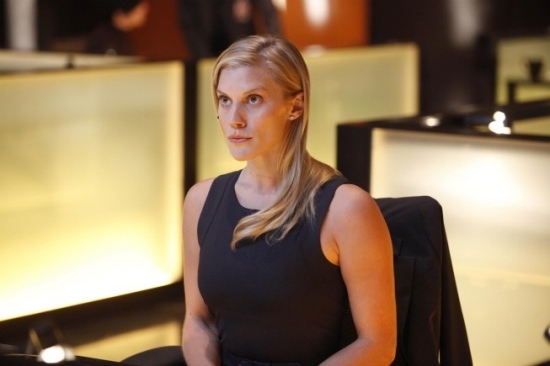 As Kara, Sackhoff was magnetic; as Dana, she is passive and reactive. I can understand Sackhoff wanting to show some range, but I really have little interest in seeing CTU’s crack data analyst crack like an eggshell when that loser Kevin showed his squirrely face. I hope the-powers-that-be give Jenny a chance to return to form as Dana and really contribute to the story. Perhaps she can save us all from the annoyingly nosy Arlo! NBC has announced what it considers the highlights of the guest list for Jay Leno’s first two weeks back behind the desk of The Tonight Show With Conan O’Brien Jay Leno, which starts next Monday, and I can say I won’t be tuning in, because there is not a single person in that lineup I have even the vaguest interest in seeing. I mean, look at this roster: the cast of The Jersey Shore, American Idol judge Simon Cowell and former Alaskan Gov. Sarah Palin? Somebody is trolling for the lowest common denominator. At least Olympic gold medalists Apolo Anton Ohno, Shaun White and Lindsey Vonn are legitimate newsmakers, but they are bound to appear in more reputable venues. Even still, they represent a blatant attempt to appeal to a much younger demographic than Jay traditionally attracts. (In other words, Conan’s crowd.) Is anyone in Jay’s usual demo even going to recognize the Flying Tomato? Kim Kardashian is not going to lure me away from Late Show With David Letterman, either. DOCTOR WHO Series 5: New Trailer debuts! Updated for Whovians in the USA! The next episode Yanks will see, on May 1, is “Victory of the Daleks,” by Mark Gatiss. Here is a link to find the preview package. The new trailer for Series 5 of DOCTOR WHO has been broadcast in the U.K., and I must say that I enjoyed it immensely. Check it out for yourself here. 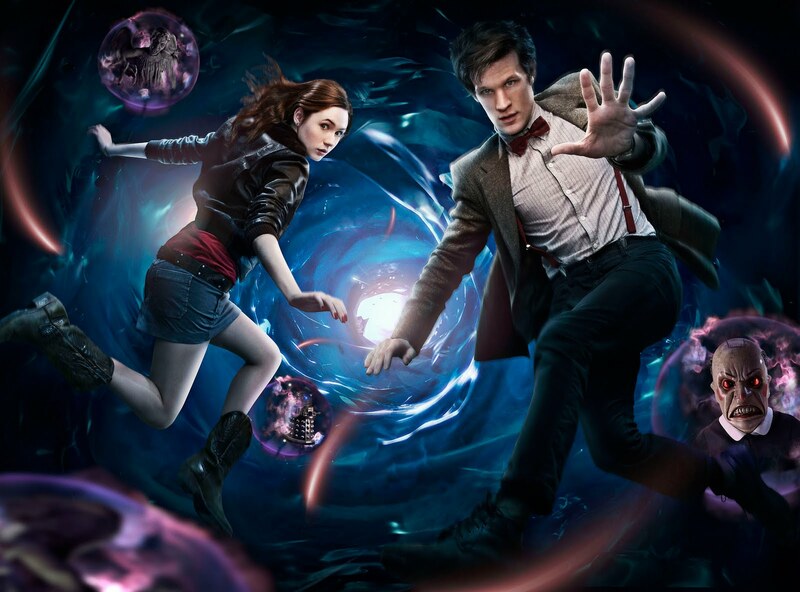 Made up of all new material (which explains the blue vortex in this promotional image), the trailer give us a few seconds of the Doctor (Matt Smith) and Amy (Karen Gillan) bonding while looking at the stars before the ground opens and we get glimpses of monsters new (the Beast thing, which I hear is called a Smiler and appears to have two faces) and old – a Dalek and a Weeping Angel. 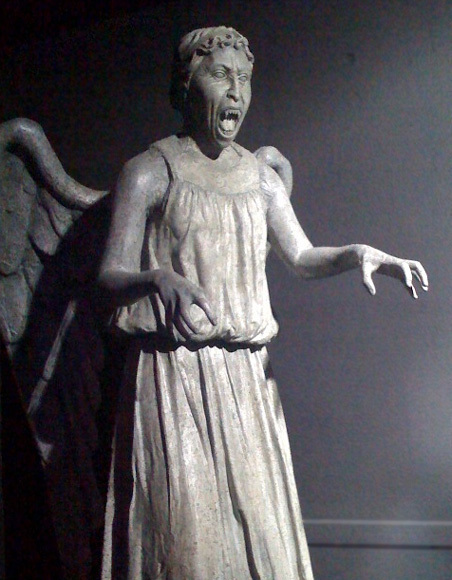 With the Angel bearing down on them, the Doctor hurls Amy to safety and takes on the beastie hand-to-hand! That’s a hero! And that lizard-like thing bursting out of the ground could be a redesigned Silurian. But whatever it is…ya gotta love it. What I like about Matt’s portrayal here is that he is playing the Doctor as self-assured and experienced, in contrast to his youthful appearance. The way he says to Amy, “Where do you want to start?” shows he has confidence in himself and his capabilities (as well has his ability to keep a companion safe). The last time we had a youthful Doctor, his fifth persona (Peter Davison) was rather more tentative – and that totally worked in contrast to the Fourth Doctor’s (Tom Baker) casual brilliance. The new Time Lord also doesn’t go overboard in the opposite direction, like the abrasive Sixth Doctor (Colin Baker). I was a little wary that the 11th incarnation was going to counteract the godlike final days of his 10th persona (David Tennant) by coming back all nervous and self-doubting. But that’s not Steven Moffatt. Moffatt knows what he’s doing, and this trailer (which builds on the first one) indicates he’s doing it right. “Who are you?” Amy asks him. “I’m the Doctor,” he replies, matter-of-factly. After successive episodes that ended with jaw-dropping twists, this week’s installment of CAPRICA was a far quieter affair. It felt like the show paused to catch its breath while giving the actors a chance to breathe in character. Paula Malcomson, Eric Stoltz, Esai Morales and Sasha Roiz got to emote bog-time, and Polly Walker added a little more depth to Sister Clarice. All this made for another impressive episode. The main story thread continued to deal with the fallout of the bombing of the MLMT train. GDD agent Jordan Durham (Brian Markinson) stepped up his investigation into the Soldiers of The One, conducting a high-profile (and thoroughly thuggish) search of the lockers at the Athena Academy, as well as a more polite tossing of the Graystone residence. Jordan is all about chasing down the terrorists who blew up the train. “I lost everyone on that train,” he tells Amanda. Later, he tells his partner, Agent Youngblood, that he feels responsible for everyone, not just family members. His searches turn up no evidence terrorist activity (beyond an infinity symbol), but Jordan is strangely comforted by the idea the school and the home were “too clean.” So coming up empty-handed strangely reinforced Jordan’s dedication to the cause. I liked this little chunk of characterization. Doctor Who Series 5: New promos! The End is Nigh! After the shocking events of “The Pandorica Opens,” Matt Smith‘s brilliant initial season in the TARDIS wraps up this week with “The Big Bang.” Can the Doctor overcome the odds and save not only the entire universe, but himself? Check out the official preview page at BBC America. It’s all been leading up to this: “The Pandorica Opens” kicks off the two-part finale of Matt Smith‘s debut season as the 11th Doctor. What is a Pandorica and why is it opening? How did Prisoner Zero know this would happen? And what did he/she/it mean when he/she/it said, “Silence will fall”? Check out the BBC America official preview page, then watch on June 17. LOST 6.4: Your Number’s Up! You wanted answers to the big questions? How about “Where did the Numbers come from?” Now we know. They came from Jacob, who wrote the names of people aboard Oceanic Flight 815 on a cave wall. And the so-called magic Numbers correspond with the survivors – well, the survivors and John Locke, depending on how you classify him. Nonetheless, the explanation was suitably spooky; c’mon, names and numbers scratched into the stone of a nearly inaccessible hidden cave. That’s pretty cool. And hey, that scale was balancing one white rock and one black rock. The Man in Black pitched the white one into the sea. How many times have we seen black and white rocks – not to mention The Black Rock slave ship? The numbers and the people associated with them are as follows: 4 – Locke. 8 – Reyes, 15 – Ford, 16 – Jarrah, 23 – Shephard, 42 – Kwon (but is that Jin or Sun?). This leaves us with one gigantic question: What about Kate? What’s her number? Did Locke/Smokey simply not show her to Sawyer? Why didn’t Sawyer ask about Freckles? See below for my theory.